Twitter Moments is oft considered a place to get an overview of the news around an event in one place, or a way to catch up on all the crap Justin Bieber has been doing. One way or another, it’s often used for bad news. The most recent is another mass shooting, this time in San Bernadino, California. 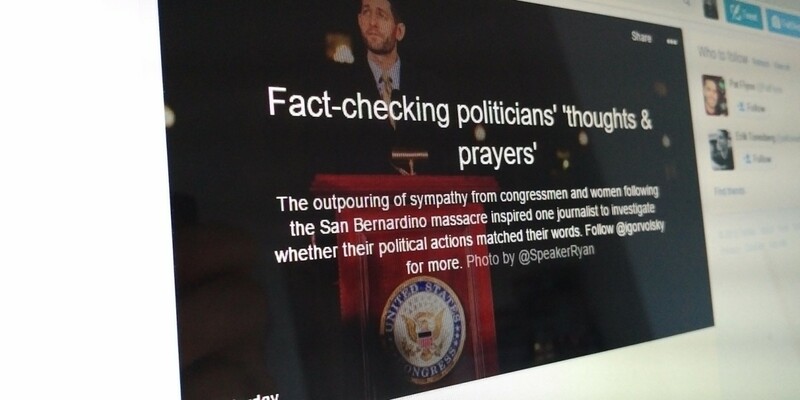 Following the attacks in the US, Igor Volsky, director of video at ThinkProgress, put the Moments feature to work in a new way – he used it to hold politicians to account for their public statements on mass shootings versus the actions they’ve taken while involved in government. Whether it was ThinkProgress or Twitter that pulled the tweets together into a Moment is unclear (as only a few publishers currently have access), but we have asked for clarification. Needless to say, it makes for some interesting reading. Now, of course, you can be sorry for the victims of a tragedy and also accept money from the NRA, but it sure as hell makes your words look hollow, whether you mean them or not. Actions speak louder than words, and if Twitter Moments is the newest tool to hold politicians to account for those, then I’m all for it. Twitter has established itself as the place for breaking news – using its tools to fact-check that breaking news (or galvanize the world in solidarity) can only make it more reliable as a source of information.